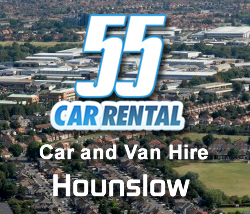 We cover car rental and van hire in Hounslow so please use our Quote and Booking system to reserve your vehicle. Should you have any queries, don't hesitate to call us on 020 8890 0155. 55 Car Rental's car fleet consists of a wide range of different sized cars to try and fulfil every rental requirement. From a small economy Ford Fiesta to a large executive Vauxhall Vectra or if its space you require then we have a choice of spacious MPVs.